A healthy diet can include Thai food, but you must choose carefully. The calories in Thai entrees vary greatly. Start off with soup to keep appetite under control. Watch out for anything fried. 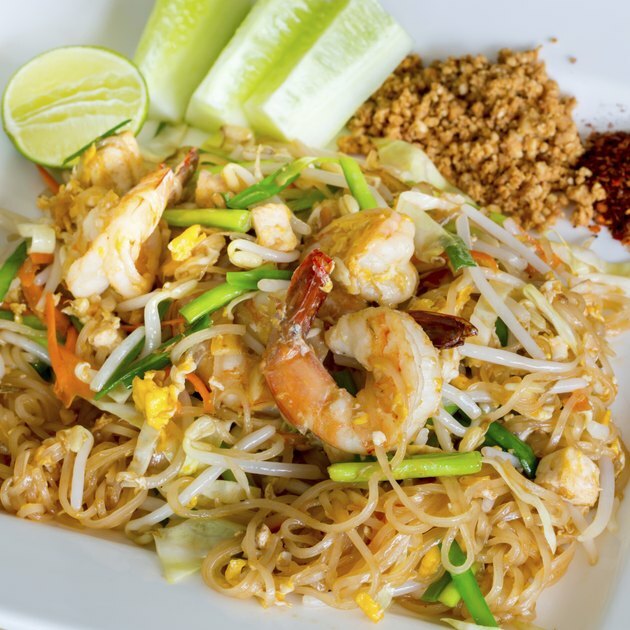 Thai food is known for its bold, spicy flavor. Meals commonly combine sharply differing flavors, such as curry paste combined with coconut milk. Coconut milk is a key ingredient in many dishes. Aquatic animals, plants and herbs also feature prominently. Calories in Thai food vary considerably. Two healthy choices, according to the Cooking Light website, are the cashew chicken and hot and sour shrimp soup. The cashew chicken contains 394 calories, while the shrimp soup has 298 calories. Avoid the musamun curry, with 760 calories, and the coconut shrimp soup, which contains 528 calories. Start with a broth-based soup, not one made with coconut milk, recommends "Reader's Digest." Order dishes that are stir-fried, steamed or grilled. Choose dishes that feature lots of vegetables.